This story from Al Jazeera is the second in as many weeks of a shark sanctuary country reaping the benefits of protecting sharks. An upcoming study (shhhhh......don't say you heard it from us) will estimate the global value of shark diving and you may or may not be surprised that it is in the hundreds of millions of dollars. In tiny Palau alone it is worth $18 million annually; in The Bahamas it is $78 million. Earlier this month the Island Times reported that Palau had reached 100,000 tourist arrivals for the first time ever. Local officials led by President Johnson Toribiong welcomed the 100,000th visitor to Palau who arrived at the Palau International Airport Thursday evening on a Continental flight from Guam. Palau Visitors Authority said the 100,000th visitor was ushered from the plane to the VIP lounge and was greeted by Toribiong, members of the diplomatic corps, lawmakers, cabinet ministers and other officials. Many of the tourist arrivals around the Pacific are falling, but Palau is trending the other way. So what is the reason? Shark conservation. Jackson Henry is the chairman of the Palau Visitors Authority. Here is what he had to say: "Palau also appreciates President Toribiong declaring Palau as the world’s first shark sanctuary. His message has resonated around the globe, bringing Palau accolades and putting Palau under the world’s brightest spot light. I say the recent surge of tourism arrival is credited to the President’s declaration. 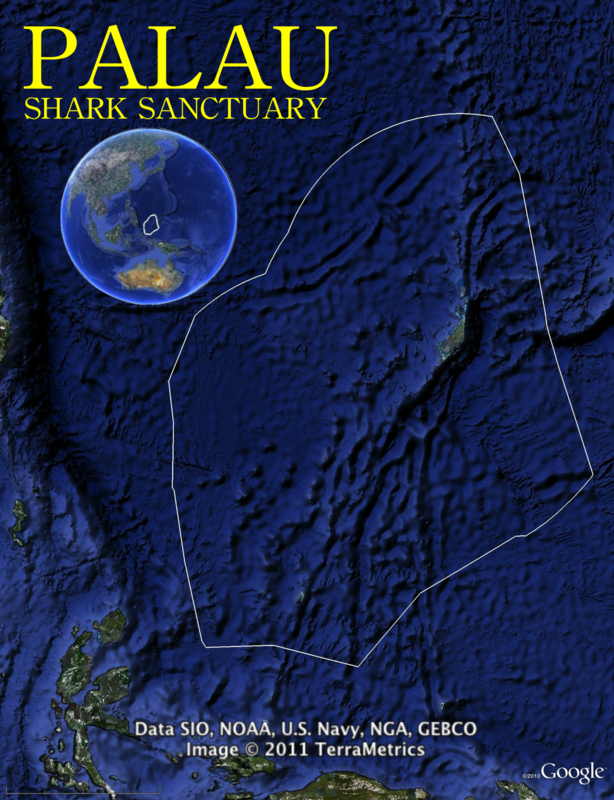 Now the world is dashing to Palau anxious to see what this first shark sanctuary has in store." And he is right. A recent economic study found Palau's reef sharks are worth millions of dollars each year to the economy and account for almost 10% of GDP. GOD created all living things with a purpose. And it is important that one must understand that and being able to strike a balance between living creatures, our culture and our surroundings. Triumphant Miss Fiji Alisi Rabukawaqa, who flew back home with the Miss South Pacific crown last week, took this message with her to the pageant in Samoa. In an interview with The Fiji Times yesterday, Miss Rabukawaqa said shark conservation was an issue that needed to be highlighted so there was an understanding of the importance of this creature to the ocean ecological system. The 24-year old, originally from Vuya, Bua on Vanua Levu, also holds this issue close to her heart given the cultural significance of sharks that is a totem to the people of Cakaudrove where her mum hails from. She drove the issue across to fellow Pacific Islanders and pageant contestants in Samoa, via the different categories she participated in. In the Sarong category, Miss Rabukawaqa wore fabric with hammerhead sharks printed on it ù designed by artist brothers Warwick and Craig Marlow. "For our ancestors, sharks were the protectors and now, they are being protected," she said. "We need to protect these creatures because of the important role they play in the ecological food chain." Miss Rabukawaqa said one thing was for sure ù sharks were in danger, attributed largely to fin trading. "There is illegal shark fishing going on where fins of sharks are removed when they are caught and they are thrown back to the sea and they will not be able to swim, they will drown and this is just plain cruelty," she said. Following the pageant, she said she loved to believe that her message on shark conservation was conveyed across eloquently, given the feedback and interest from people who approached her with more questions on the issue. "There were people who were interested in the shark painting on my sarong and it was also an opportunity to tell them about the plight of sharks," Miss Rabukawaqa said. She said for the Pacific, people related more to their culture and how such issues held symbolic significance in their respective villages. Miss Rabukawaqa said she would "definitely" support initiatives that continued to promote shark conservation and join in efforts to help protect these lucrative predators. Meanwhile, Global Shark Conservation PEW Environment Group manager Jill Hepp said increased awareness were being conducted locally to protect sharks. "We're concerned because sharks play an important role in the ecosystem and they are an important component in the protection of coral reefs," Ms Hepp said. She said between 70 to 90 per cent of sharks decline in global waters annually because of the demand for fin soup. "That trend is concerning because sharks, unlike other fish, takes a long time to reproduce." Ms Hepp also revealed that some 73 million shark fins are traded every year, which was an enormous scale. On the global front, for Taiwan in particular, she said they caught about 49,000 tonnes a year ranking them number four in terms of global shark catches. "They're a big player. Their vessels are fishing everywhere," she added. Published in The Fiji Times on Monday, December 19. Written by Timoci Vula. At its December 2011 meeting held in Berlin, the Marine Stewardship Council (MSC) Board of Trustees resolved that fisheries engaged in shark finning would not be eligible for certification to the MSC standard for sustainable fisheries. Shark finning is defined as the practice of removing and retaining any of the fins (including the tail) of the shark, and returning the carcass of the shark to the sea. The Board’s decision is based upon international norms and consensus, such as that expressed in the FAO’s International Plan of Action for the Conservation and Management of Sharks, as well as scientific and management grounds. This decision will become effective in March, 2013, following development of the technical implementation mechanism and opportunities for public consultation during 2012. There is a difference between shark fishing and shark finning. In terms of finning, nearly every country in the world bans it. Enforcement of a finning ban is a whole other thing, but the policy is already in place for most countries. It will be interesting to see if MSC will focus on policy or enforcement when making their determinations of sustainable fishing. Will a country with a shark finning policy, but no enforcement be able to qualify for MSC certification? Hope not. A new show on the Travel Channel is airing this Sunday (9 PM EST/6 PM PST) and it has a novel premise: send a team of high-end Hollywood photographers to a series of remote locations and recreate a professional photography studio underwater. To this end, the team has pioneered new camera rigs, shooting platforms and lighting equiopment that supplies the kind of high-voltage illumination normally reserved for the cover of high-fashion magazines like Vanity Fair. 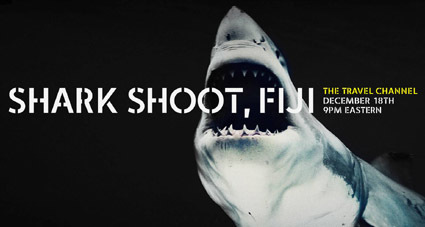 In their first shoot in Fiji, Muller and his team descend 70 feet where they find and photograph over 8 varieties of sharks. One of their goals is to finally put a face on these elusive creatures who in many regions are struggling to survive with increasing pressures from shark-fin hunters, overfishing and changes in ocean temperature. The airing of this show comes as Fiji is contemplating permanent protections for all shark species, and coming fresh on the heels of shark champion Alisi Rabukawaqa being crowned Miss South Pacific, raises the issue of shark protections in Fiji to new heights. You can support shark conservation efforts in Fiji and the rest of the South Pacific by taking the Fiji Shark Defenders Pledge. Sign up and you will receive periodic updates on the progress of the Fiji Shark Sanctuary and how you can help. Pew Environment Group and Coral Reef Alliance have more information on their respective websites. 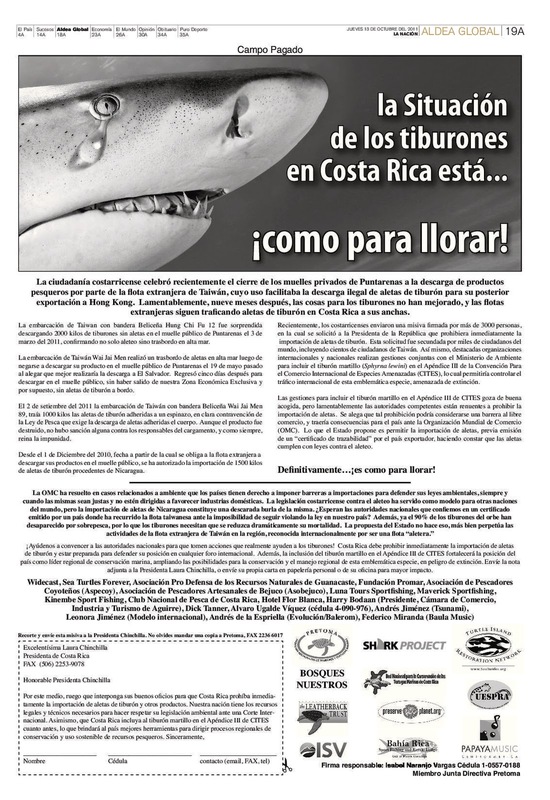 Our friends in Costa Rica have asked for support in banning the importation of shark fins (in English and Espanol). A petition is available online. Please download the petition, sign, and either email, mail, or fax it in. We the undersigned, respectfully request that the importation of shark fins be immediately banned through a Presidential Decree, to close the legal loophole and direct Costa Rica towards a sustainable fishery. Foreign fleets are currently evading Costa Rican shark finning controls by landing shark fins in Nicaragua, loading them in Costa Rican trucks, and then importing them back into Costa Rica by land through Peñas Blancas, for later reexportation. 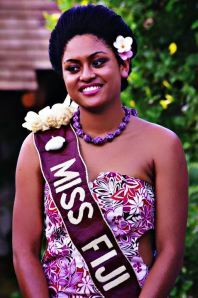 Miss Fiji Alisi Rabukawaqa was crowned the new Miss South Pacific, news that one would normally find on a blog dedicated to shark conservation, except that Miss Rabukawaqa has made shark conservation and the creation of a Fiji Shark Sanctuary the focus of her pageant platform. Congrats to the new Miss South Pacific and all the other contestants. We look forward to a year full of shark protections and advocacy! 2011 has been a banner year for shark protections, both in terms of enactment of policy and the beginnigs of enforcement. What will 2012 bring? 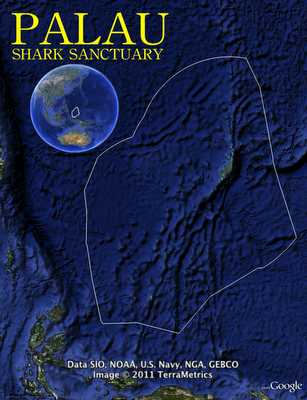 A Fiji Shark Sanctuary would sure be a nice start. 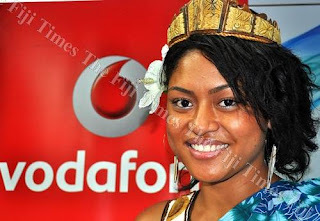 Alisi Rabukawaqa is the new Miss South Pacific, 24-year-old Miss Rabukawaqa was crowned last night, in Apia, Samoa. Rabukawaqa who is also the current Vodafone Miss Fiji Hibiscus is a volunteer with the World Wildlife Fund and has been advocating on the issue of shark protection at the pageant. She also grabbed Best Interview award in the Special Awards category. Palauan fisheries officials have boarded and detained a Taiwanese fishing vessel suspected of illegal fishing activities during a joint patrol with Greenpeace of the Pacific Island nation’s exclusive economic zone. The Greenpeace ship Esperanza and the Palauan patrol boat, PSS President H.I. Remeliik, are currently escorting the vessel Sheng Chi Hui to port. A Greenpeace helicopter flight spotted the sharks and fins on board the Sheng Chi Hui on the morning of December 8th, while the fishing vessel was inside Palaun waters – which were declared a shark sanctuary in 2009. “The Sheng Chi Hui was in apparent breach of the law here in Palau’s exclusive economic zone. Illegal fishing is costing the future of our people, our country’s economic development and is a threat to the future of the legitimate fishing industry. It must be stopped,” said Palau President Johnson Toribiong. Greenpeace and the Government of Palau signed a joint agreement earlier this week to both enforce fisheries regulations and bring illegal pirate fishing operations to justice. “We are honored to be working with Greenpeace in the protection of our fisheries resources and securing the livelihood and future of our people. Let this be a warning to illegal operators,” President Toribiong continued. Between 21 percent and 46 percent of all fishing in the Western Central Pacific Ocean is thought to be Illegal, Unregulated and Unreported. The illegal plunder of fish from the Pacific is putting the region’s food security and economic prosperity at risk. Like most Pacific Island countries Palau must patrol vast territorial waters with very limited capacity; it has one patrol boat and more than 604,000 km2 of ocean to patrol. “Illegal fishing carried on by vessels like the Sheng Chi Hui is rampant in parts of the Pacific, with the slaughter of sharks and the theft of tuna occurring on a daily basis”, said Lagi Toribau, Greenpeace campaign leader on board the Esperanza. “If this continues, we will see a Pacific region with empty nets, empty plates and empty bellies. We applaud the Palauan government for taking a stand and enforcing its laws. Now we are calling on the Taiwanese government - as the responsible flag state - to better regulate its fishing industry”. The Sheng Chi Hui will undergo further investigation by Palauan officials on its arrival in the country.Yesterday, officials from the Remeliik boarded an unlicensed Philippine flagged reefer, F-B Yanreyd 291, confiscated its fishing gear and catch and escorted it out of Palau’s waters. Greenpeace’s "Defending Our Pacific" tour is campaigning to prevent the plunder of Pacific tuna and for the restoration of the health of the world's oceans through the creation of marine reserves. The international environment group is calling for marine reserves to be established in four high seas pockets of the Pacific Commons, and be declared off limits to fishing. The environmental group is also seeking a ban on the use of FADs in purse seine fisheries and a 50 percent reduction across the entire tuna fisheries. These measures are important to keep valuable fish stocks at a sustainable level. Greenpeace is campaigning for a global network of marine reserves covering 40% of the world’s oceans and for a more sustainable fishing industry, both necessary steps to restoring our oceans to health. Around the world, Greenpeace is working with retailers and tuna brands across Europe, Australia and the Americas to increase the market share of sustainably-sourced tuna. One year ago today, Shark Defenders was born. What a year it has been! Thank you for all your support, for taking the Shark Defenders Pledge, signing onto our Action Alerts, donating photos, following us on Facebook, retweeting our tweets, and generally being there to help us create new shark sanctuaries and advocate for the proper management of sharks and ray species worldwide! The Pew Global Shark Conservation Campaign is looking for a communications expert. Pew is the leader in global shark conservation having supported efforts to end the commercial fishing of sharks in the Pacific, Atlantic, and Indian Oceans. The job posting is online. Follow the link to apply. The position is based in Washington, DC, United States. Transition to a clean energy economy from one based primarily on the burning of fossil fuels. The destruction of the world’s marine environment, with a particular emphasis on global fisheries. Position Overview: The communications officer will work on a daily basis with programmatic campaign staffs, and will assist and advise Pew Environment Group (PEG) campaigns on outreach to journalists, web content, and all aspects of public communication. While supporting issues relating to PEG, this position reports to the head of communications for PEG within the central Communications department. Pew’s global and highly visible shark campaign is seeking full-time communications support. The ideal candidate will have a passion for shark conservation, keen ability to shape and pitch stories, strong writing skills for preparing press materials, fact sheets and web content and the ability to translate dense information into compelling visuals [emphasis mine]. Provide support for PEG related communications as needed. A minimum of eight years in advocacy communications. College degree required. Must have excellent oral communications, writing, editing and research skills, and proven ability to frame and develop cogent messages. Skills associated with completion of an undergraduate degree program in communications, journalism or related major required. Graduate degree preferred. Must demonstrate understanding of media and news organizations, particularly broadcast media and web-based outlets. Must be flexible, creative, consistent and assume high accountability for all areas of responsibility. Must demonstrate strong collaborative spirit and leadership ability. Ability to think strategically, handle multiple priorities, be extremely well-organized, manage time effectively and identify resources for projects required. Aptitude for understanding organizational structure and working through administrative systems preferred. Must be able to work in groups and individually to meet goals. Passion for achieving goals to protect the environment. The Pew Charitable Trusts offers a competitive salary and excellent benefits package, including a generous 401(k) plan, four weeks vacation and flexible benefit options.